What is an LSAT median, and why does it matter? An LSAT median is the LSAT score that falls in the middle of an incoming class's distribution of LSAT scores. Half the scores are above the median and half the scores are below it. If your top LSAT score is below the median, you'll probably need to make up for it with an above-median GPA. If your top score is above the median, you have a good chance of getting in. A median is not an average, so being close to a school's median doesn't necessarily matter. You either hit the median or you don't. One point makes a difference. ✏️ More: Law schools are required to disclose six critical numbers about each entering class: the 25th, 50th, and 75th percentile LSAT score (based on each applicant’s highest score), and the 25th, 50th, and 75th percentile undergraduate GPA (UGPA). A 50th percentile LSAT score is also called an LSAT median, and it’s the LSAT median that counts most. Specifically, a school’s LSAT median counts for 12.5 percent of its U.S. News & World Report rank. The UGPA median (aka the 50th percentile UGPA) matters second most: it counts for 10 percent of a school’s USNWR ranking. Okay, but what IS a median? The average is 166. The median is 175. What does the median tell me about my chances of admission? Let’s take a historical example. 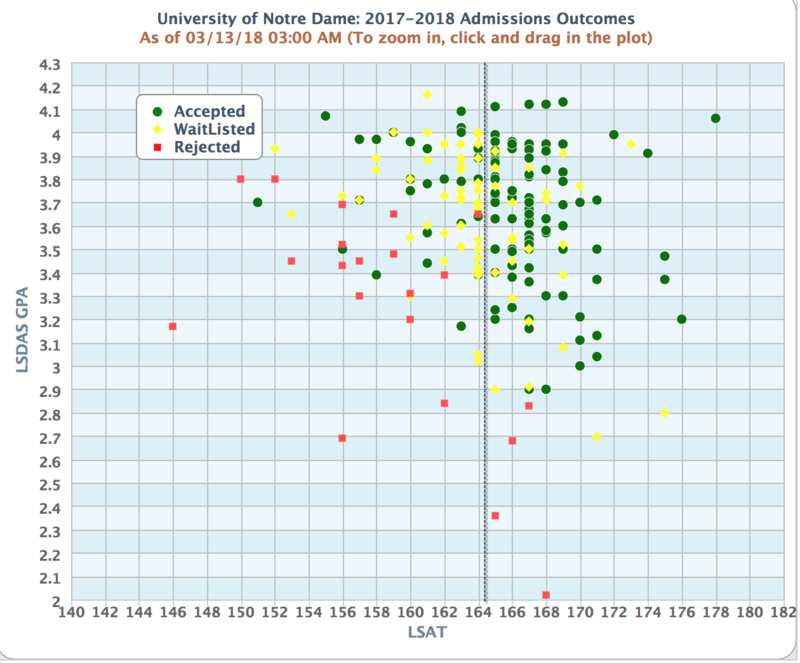 Notre Dame Law School’s LSAT median for the 2021 class was 165. That means that half of NDLS’s matriculating class had LSAT scores lower than 165; half had LSAT scores higher than 165. 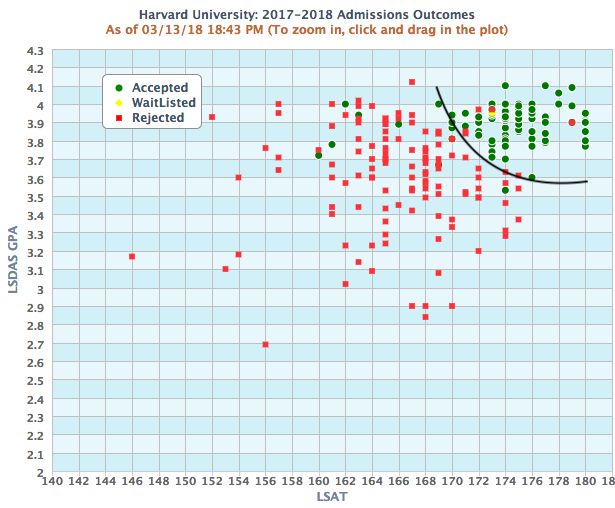 Most applicants in this dataset with LSAT scores of 164 were waitlisted. Most with LSAT scores of 165 were accepted. The graph illustrates that law schools base their decisions on both LSAT scores and UGPAs. A stellar UGPA can sometimes compensate for a below-median LSAT score, and vice versa, but it's unlikely that you'll get into a school if both your LSAT score and GPA are below the median. Of course, medians may change from year to year, and there are always outliers, but your scores and a school's medians should be your starting point as you put together a balanced list of reach schools, targets, and safeties. What Affects Your Chances of Getting Into Law School?